Extra Heavy Walking Foot Long Arm Sewing Machine. Highlead GC20698-7 extra heavy duty long arm single needle lockstitch industrial sewing machine for stitching heavy & extra heavy weight materials. 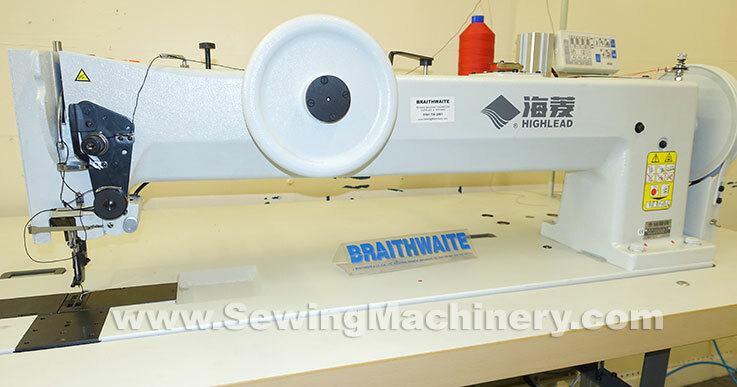 The long arm flat bed allows up-to 760mm* (30") clearance to the right of the needle, which is approximately Three times the length of a standard sewing machine arm, and has a high under arm clearance of 145mm. The Extra Long arm + high arm is factory cast for greater strength & stability; when compared with cut and piece extended arms. 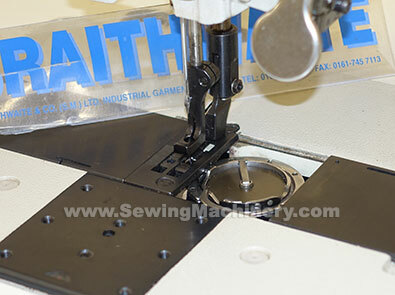 It features a triple feeding action by way of: bottom feed, needle feed & walking foot top feed and is fitted with an extra large vertical axis hooks for use with thick heavy duty sewing threads. Sewing applications include extra heavy stitching of canvas, vinyl, leather, webbing, laminated materials, coated fabrics, tents, tarpaulins, awnings, lorry side covers, sails, material structures, covers and many other heavy or bulky items. Highlead GC20698-7-NPAA model features a high torque full sized 1HP electronic needle Positioning motor, air assisted reverse device, air operated automatic foot lifter, Knuckle quick reverse system and electronic stitch count box with slow speed inching control. Long arm, 760mm* (approx. 30") clearance. Foot operated reverse stitch device. Push button stitch size adjuster. Extra heavy long arm and high arm version. Knuckle operated reverse stitch device. Air operated reverse stitch device. 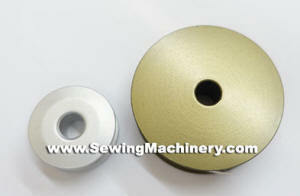 Normal sized industrial sewing machine bobbin in comparison with the Extra large GC20698-7 bobbin. *approximate subject to application and materials etc. Video demonstrates GC20698-8T-NPAA twin needle variant with optional equipment.